I’m going to be away from the blog for the weekend at a national weightlifting meet. For the weekend only I will run a $100 6 month special. That’s $20 off the normal 6 month rate. Here is the link to the premium site. Scroll down to the lower right hand side of the home page and click on the Subscribe link. Enter in the promotional code box and click continue. You will be linked to a page with the discounted subscription offer. See ya when I get back…hopefully uninjured and with another national title under my belt. This entry was posted in Uncategorized on March 31, 2011 by Gary. We need a comment cleaner so I thought I would post the 2b reversal on the XLE for you short term traders. 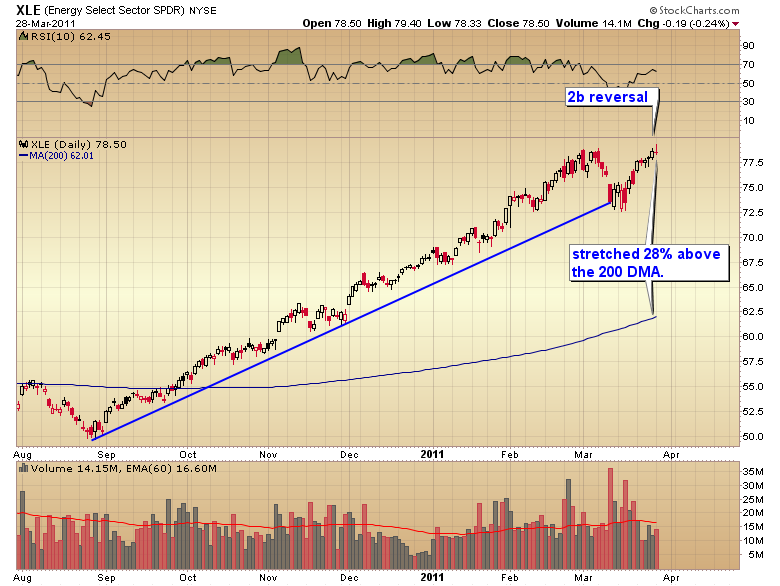 Hint: very tight stop with high risk reward ratio. Explanation of the 2b reversal is in the terminology document for subscribers. This entry was posted in Uncategorized on March 29, 2011 by Gary. How many times have we heard this one? The miners are lagging. It’s a sign that gold is topping. 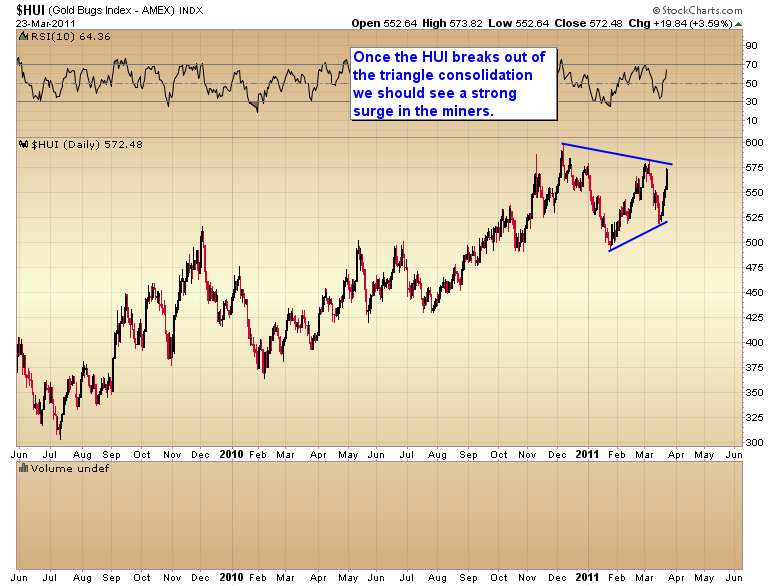 The miners aren’t lagging, they are consolidating in an extremely bullish triangle continuation pattern. I said in the Tuesday report that the miners would probably test the upper trend line this week and maybe even breakout. We may get that test as early as tomorrow. Folks this is now moving into the momentum stage. During this phase of the C-wave we will see gold and silver grind higher day after day. It’s not unusual to see the metals rise at a 70 or even 80% clip (7-8 days out of 10 are up days) during the final two daily cycles up in the parabolic blow off top that always unfolds as a C-wave comes to an end. The momentum phase is just now starting. This entry was posted in Uncategorized on March 24, 2011 by Gary. I think we are fast approaching the lift off point for the parabolic rally that always caps a C-wave advance. Once that begins there will be no more good entries into this market. All pullbacks will be mild or intra-day only. I’ve done everything I can think of to get people on board before the move starts. Hopefully you took the advice and got in at the intermediate cycle low in January or at the daily cycle low last week. I’ve cautioned repeatedly to ignore the technicians trying to call tops. These analysts just don’t understand what is happening to the dollar. This isn’t about technicals. It’s about fundamentals. This is about a currency crisis. Folks in a currency collapse you would have to be an idiot to go to cash. I guarantee the market taken as a whole isn’t stupid. It’s going to find a way to protect itself. That will of course be to exchange dollars for gold, silver and mining stocks as the dollar collapse starts to intensify. There will undoubtedly be a never ending stream of top callers all the way up. But the market is going to make these people pay dearly for jumping off the bull too early. Overbought is going to be a meaningless term in the days and weeks ahead. The only thing that will matter is finding something to buy in order to protect ones purchasing power from the currency crisis. 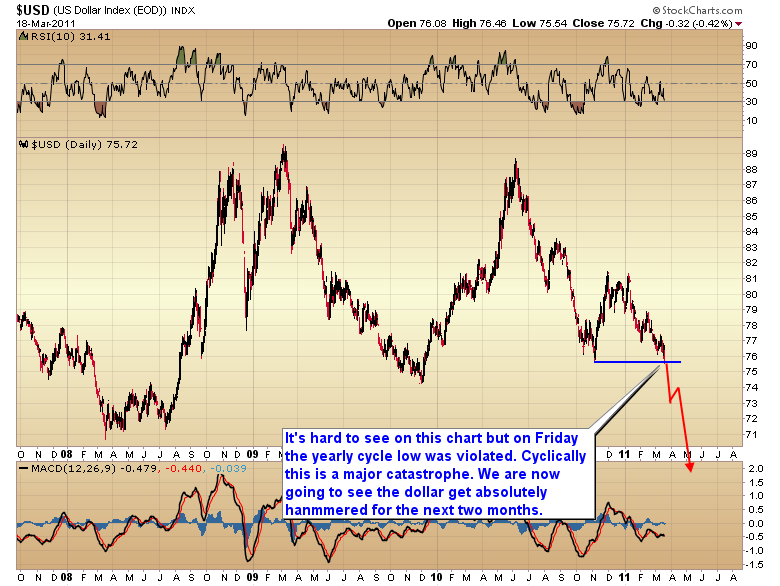 This will not end until the dollar puts in the final three year cycle low. This will be the last day for the 15 month special. 15 months for the price of 12 ($200). Here is the link to the premium website. Scroll down to the bottom of the page and click on the subscribe link. Enter ‘smt15‘ in the promotional code box and click continue. That will take you to a page with the 15 month offer. The offer has now ended. This entry was posted in Uncategorized on March 23, 2011 by Gary. For months and months I’ve been warning investors that the dollar was going to come under extreme pressure sometime this year. I expected it to probably happen in the spring. Many people thought I was nuts. They were sure it was the Euro that would collapse, despite the fact that the EU is doing everything they can to protect their currency while Bernanke is doing everything he can to destroy ours. On Friday the last confirmation occurred to signal the final collapse is now underway. On Friday the November yearly cycle low was violated. Cyclically that is a major catastrophe. In a currency collapse the market will flee into assets that will retain their purchasing power. Four weeks ago we went past the point of the stock market being able to protect one from Ben’s printing press any longer. So buying stocks as protection is no longer a viable solution. Four weeks ago spiking inflation rose to the point where profit margins are now being hit. Ben will no longer be able to prop up the stock market by further debasing of the currency. 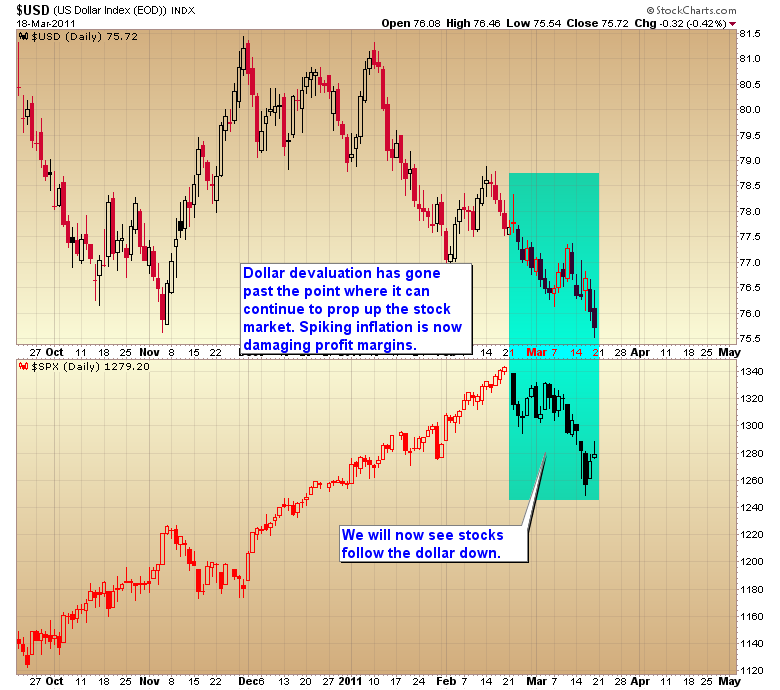 Stocks have now decoupled from their inverse correlation with the dollar and will now follow the dollar down. The more Ben prints and the faster the dollar collapses, the faster the stock market is going to fall…and the quicker the economy is going to roll over into the next recession. This is why one has to ignore the top pickers and chartists. Overbought oscillators and stretched conditions are meaningless in a currency collapse. This is all about fundamentals. It’s about protecting your purchasing power. You can’t do that by exiting the one sector fundamentally best suited to protect you during this storm. Now isn’t the time to be selling your gold, silver or mining stocks, its time to be buying more. This entry was posted in Uncategorized on March 20, 2011 by Gary. I’m fairly confident gold has put in its daily cycle low. This will probably be the last chance to enter before the C-wave finale starts the parabolic run to the top. Stops have been raised. Risk is now about as low as it’s going to get. I will open the 15 month special one more time for any late comers that want to ride this final run. Enter smt15 in the promotional code box and click continue to link to the special offer page. Here is the link to get you to the subscription page. This entry was posted in Uncategorized on March 18, 2011 by Gary. I’m fairly confident Tuesday marked the daily cycle low, barring another exogenous event coming out of Japan in the next day or two. I have updated stops and trade trigger on the website . 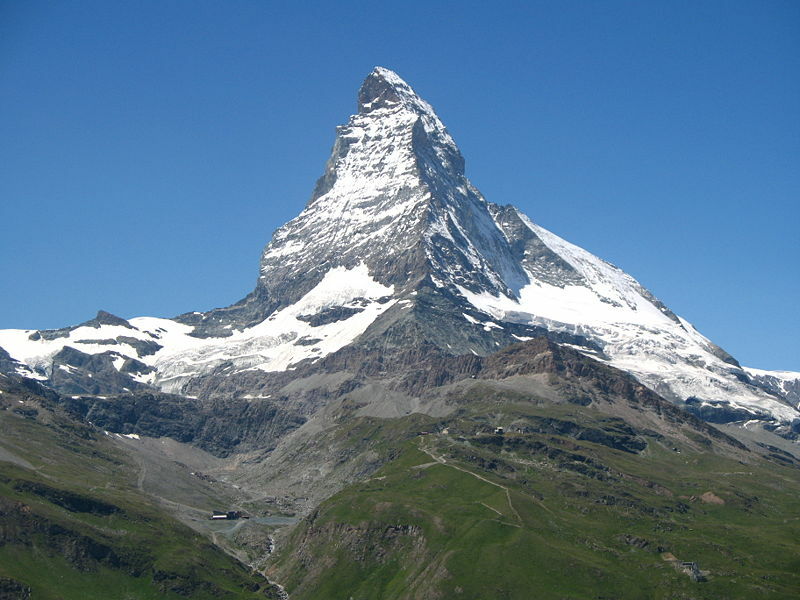 The travel and accommodation details for the next “trackers” trip to Zermatt Switzerland have been posted to the website. This entry was posted in Uncategorized on March 16, 2011 by Gary. This is for all you folks out there with retirement accounts in the general stock market. I’ve been warning for many months that the cyclical bull we’ve been in for almost two years is still just a counter trend rally in an ongoing secular bear market. I made that same warning about the last cyclical bull market from `02 to `07. Many people ignored me in November `07 when I said the second leg down in the secular bear had begun. I suspect many people wish they hadn’t. There are now warning signs that this counter trend rally may have topped, and even if it hasn’t the potential upside is so small that it’s not worth the risk of getting caught in the next bear leg to catch a few more percentage points. 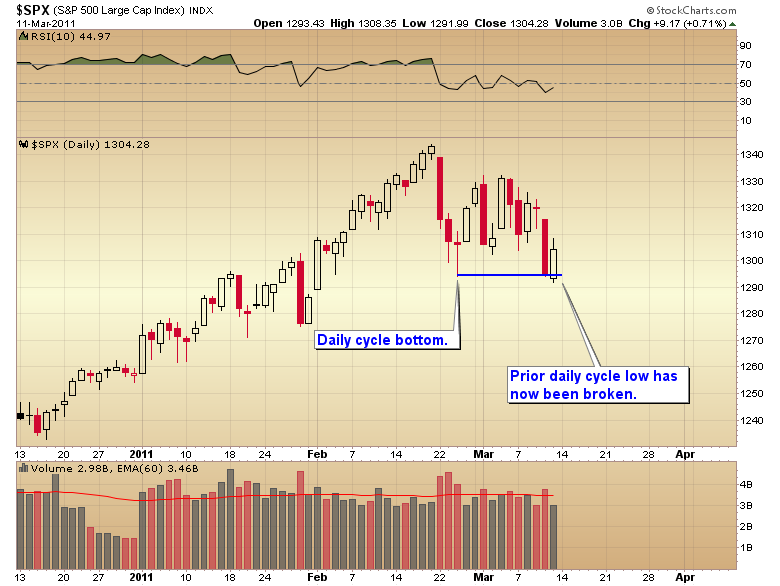 As of Thursday and Friday the stock market has now broken below the prior daily cycle low. When a daily cycle low gets violated it invariably signals the start of an intermediate degree correction. The warning bells are going off not so much because an intermediate degree correction has begun, those happen like clock work about every 20-25 weeks, but because of how quickly this daily cycle has topped. In only three days. That means we are now locked in an extremely left translated daily cycle. It is those extreme left translated cycles that do the most damage. The daily cycle following the flash crash last year was a left translated cycle that topped in only 4 days. We all know what that led to. The bigger picture is the intermediate cycle. 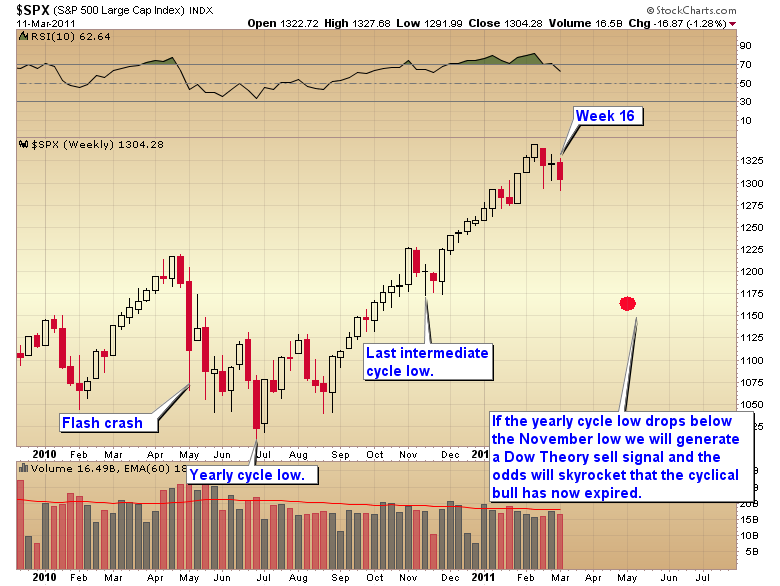 Notice the market is now on week 16 of the current intermediate cycle. I noted earlier that an intermediate cycle low is due about every 20 to 25 weeks. On an intermediate term basis the market is now due to move down into that major cycle low. The next larger cyclical structure is the yearly cycle. That is also due to bottom with this daily and intermediate cycle. The combination of all three cycle durations bottoming at the same time will almost always produce a very severe correction. Because of how the dollar cycle is unfolding (available to premium subscribers) I expect the stock market cycles to bottom pretty close to the 1 year anniversary of the flash crash. As a point of reference the last intermediate cycle low occurred in November. The danger is that both the industrials and transports might drop below the November bottom during this correction. 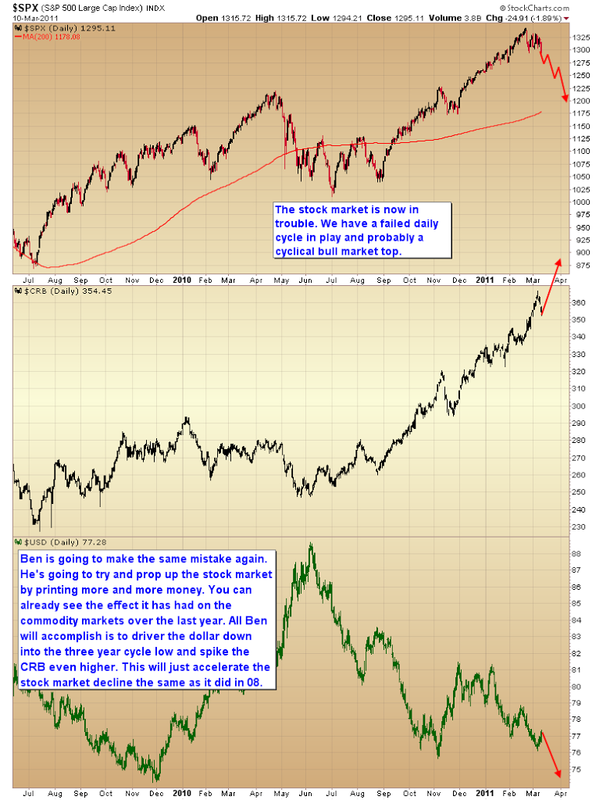 If that happens a Dow Theory sell signal will be generated. 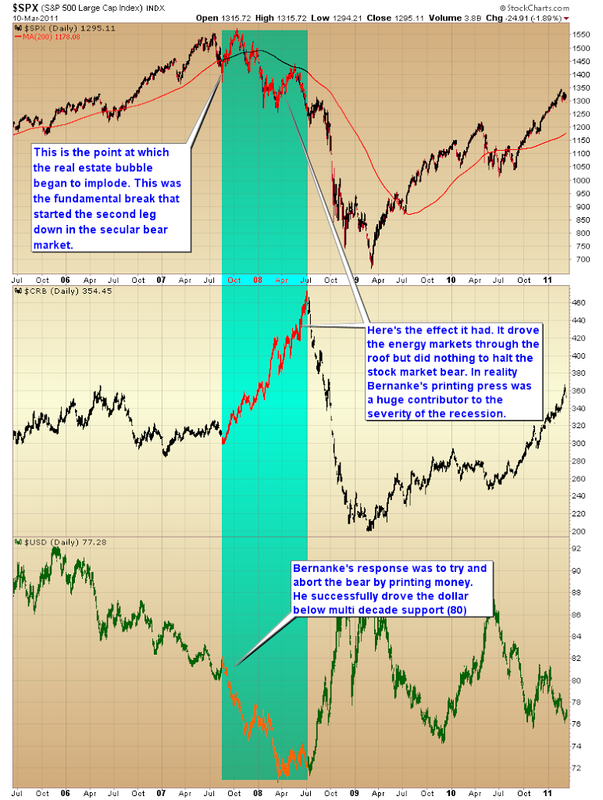 If a Dow Theory sell signal is generated the odds will be very high that this counter trend rally is over and the next leg down in the secular bear market has begun. And unfortunately Bernanke is not going to be able to just crank up the printing presses and rescue the markets like he did last summer. The problem isn’t that there is a shortage of liquidity. The problem is that there is too much liquidity. It is causing commodity prices to surge out of control. Oil is back over $100 despite continued high unemployment and impaired demand. Food prices are going through the roof and have already trigger social revolt throughout the mid east and most emerging markets. Once the next leg down in the dollar crisis gets underway it won’t be long before we here in the US will be looking at $4.00 or $5.00 for a gallon of gasoline. As the dollar crisis intensifies Bernanke will be forced to end QE or risk breaking not only the currency but also the bond market. Without an endless supply of fresh money the markets and economy will quickly start to collapse. We saw this last summer when QE1 ended. The same thing will happen this time only Bernanke’s hands will be tied by the dollar crisis and surging commodity inflation. He will be powerless to prevent the return of the secular bear forces. Well unless he’s prepared to risk hyper inflation that is. Personally I don’t think Ben is willing to completely destroy the dollar and crash the bond market just yet. I suspect when he finally realizes that Keynesian economic principles have led us down a path of no return he will resign and someone else will put the finishing touches on his master piece. The only question is whether those finishing touches will be to allow the deflationary depression that is required to cleanse 5 decades of debt from the system or whether we will choose the hyper-inflationary path to service the debt spiral we’ve gotten ourselves into. In any case it is time to exit all general stock market funds and position oneself in cash to ride out the next leg down in the secular bear market. If one has a gold or precious metal fund available in their IRA we should have about two months left of spectacular gains as the parabolic finale unfolds in the gold and silver markets. But once that has run it’s course even those positions will need to be exited as there is no real way to diversify against another severe bear leg down. The simple fact is that in a severe bear market everything gets taken down to some extent. Gold will hold up much better than practically all other assets but even gold will take a 20-30% hit during a D-wave correction. And all parabolic C-wave finales are invariably followed by an severe regression to the mean profit taking event. Unless one has the option of a gold fund, it’s now time to get out of general stock funds and move IRA’s to a money market fund until the next four year cycle low is reached (probably in late 2012). This entry was posted in Uncategorized on March 13, 2011 by Gary. The charts say it all. Ben is going to make the same mistake all over again. This entry was posted in Uncategorized on March 11, 2011 by Gary.